In April 2016 it was announced that Scandinavian artist-duo Michael Elmgreen and Ingar Dragset had been appointed curators of the 15th Istanbul Biennial. Last December its title was revealed: A Good Neighbour. The artists have done their job in trying circumstances: Turkey has gone through a coup attempt, postcoup crackdowns, several terrorist attacks, a constitutional referendum and a still-operational state of emergency. Nonetheless, when Nicole O'Rourke met them in a café on the European side of Istanbul two weeks before the exhibition opens – comprising work by 55 artists presented across six venues – the pair seemed relaxed. This year marks both the biennial’s 30th anniversary and the 30th anniversary of Turkey’s first application to become a full member of the European Economic Community – the forerunner to the European Union. 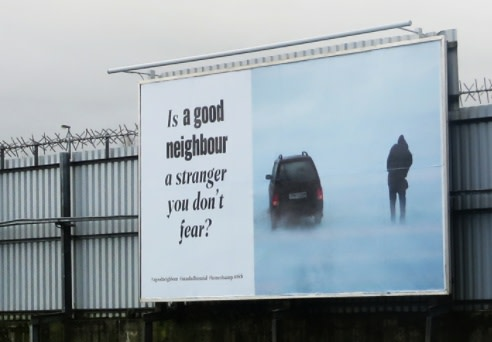 A Good Neighbour seems especially poignant in this context. ARTREVIEW At the 2009 Venice Biennale you transformed the Danish and Nordic pavilions into the homes of two fictional collectors. It was as much a curatorial venture as an artistic one, featuring works by other artists as well. The two characters were neighbours, but one had died and the other appeared to be in the middle of a divorce. The pavilions provided a voyeuristic fantasy into the private lives of others. In what ways does this work inform or act as a prelude to A Good Neighbour? INGAR DRAGSET The Venice project was a gesamtkunstwerk for which we collaborated with 24 other artists to create a narrative. So each artwork became part of a story, which is a very different approach than the one we have used here in Istanbul. Although, of course, the themes of home, domesticity, interior design, identity related to interiors, of how we express ourselves in our close environment, how interiors relate to exteriors and the world at large, these are things that we have been interested in for a very long time. And we felt we wanted to start the biennial’s curatorial process by exploring something we know about – so we don’t start completely from scratch. The biennial has given us a chance to travel the world and meet people of different ages and backgrounds, artists involved in many different practices. This has enabled an expansion of our interests into areas that we ourselves are perhaps not able to talk about directly in our own work. For example, through the biennial we could look at our research interests from a woman’s position: from feminist positions. It’s also diffcult for us to talk about domesticity and ‘belonging’ in terms of race in our own work: we’re white Europeans; we’ll always be associated with a privileged part of the world. MICHAEL ELMGREEN Herewe are not working with one story. We are working with multiple stories – from South Africa, Asia, South America and, of course, Turkey. Many of the problems that we face globally today will be dealt with from very personal perspectives, reflecting the artists’ different backgrounds. Many of the stories have a starting point in the artist’s life-experiences, which is really important, I think. At a time when the media dominates our consciousness and our perception of each other as neighbours, as other human beings (when the media determines our coexistence), we forget about our own personal experiences. The biennial aims to counter this, speaking with multiple voices about how we might live together.